The team is mainly slogging through swamp. It is inundated forest southwest of Obenge: a lot of swamp forest, isolated dry hillocks, then again swamp and always another river to cross…day after day. The “Boussolier” with the compass calls out directions to the “pisteur” with the machete who is breaking trail up front: “Stay right” “Straight to that Apakipekipe,” (a big swamp tree). Slow going. Bernard and Muhindo are the observers behind the boussolier: one keeps his eyes in the treetops watching for primates, the other’s eyes are on the ground looking for tracks, elephant “rubbings” or dung. Both take notes. Seven porters follow behind with tents and food. 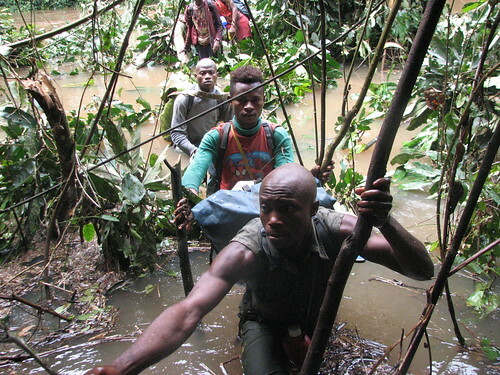 At least four more days of wet-knee transect before returning to Obenge, the village that is our current base. It is the pisteur, stepping up on some nominally firm ground, who sees them first. “Pembe!! Hey, two pembe (tusks) right here”. Pembe is white gold. You don’t find elephant tusks just lying around in the forest. But these were just lying there— actually half buried and they were huge, compared to the size of tusks found on the forest elephants hunted today. They dug and pulled them from the muck and ground tangle. They were nearly black , with ruts and riddles from years, probably decades of slow weathering. Did some big elephant just come here to die? The team scoured the area for bones – none. Even teeth – none. Or maybe it was some poacher — If so, how long ago? — and if so, why did he leave the tusks? Besides, there is no path near-by, nor a navigable stream, nor any kind of recognizable landmark. Even today the poachers of TL2 , have no compass, let alone GPS. They would not even temporarily leave such wealth in such an unrecognizable place. But maybe such obscurity is just the sort of place an old or wounded elephant would seek to die. At 25kg those tusks would have fetched well over a thousand dollars just in Opala. 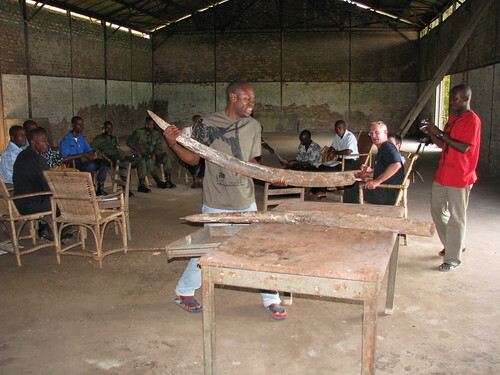 In Kisangani? In Kinshasa? In Dubai? Before they had been so “weathered” on the outside, how much did they weigh? Ashley got an SMS on his satellite phone sent from the team’s satellite phone. “What do we do, boss? Throw them in the river or bring them back?” They brought them back. Crispin is holding one of the tusks to show to officials in Opala. John and Ashley in the background. The tusks might be white gold, but they are also contraband and associated with the most unscrupulous of poachers. Obenge’s Chefitaine de Village said, “Take them to Opala”. In Opala the authorities said, “Take them down to Kisangani”. In Kisangani a very self-important Chef de Ressorts Désirables (= chief of desirable finds), signed for the ivory and took it, presumably, to the bank. Presumably. This entry was written by Terese Hart, posted on 2008-04-09 at 9:59 pm, filed under Elephant. Bookmark the permalink. Follow any comments here with the RSS feed for this post. Post a comment or leave a trackback: Trackback URL. Those tusk are huge! Good map, good photos, good story. Hi! Thanks for all that you are doing! I’m ear deep in a bonobo project for kids and I’m wondering if you have a moment to email me for some quick questions? Great map Terese, wish there were more dark green areas. Proof these areas need to be protected. 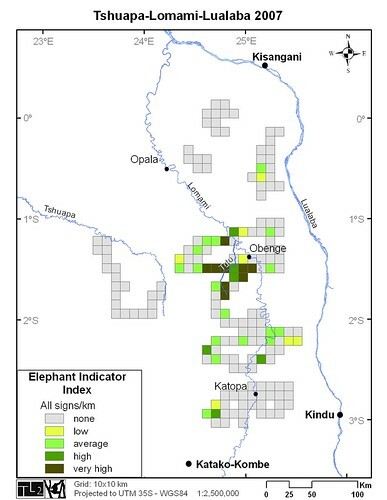 I would love to see an overlay of the areas most populated by the bonobos, to get a sense of how much they share the same habitat with these elephants. Please convey to the entire team what important work they are doing. I wish I could send them a nice, hot shower for all their troubles. protected rainforest from north to south. again thanks for all of the hard work of the team. 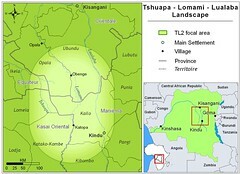 We too hope for a long swath of protected forest through TL2. 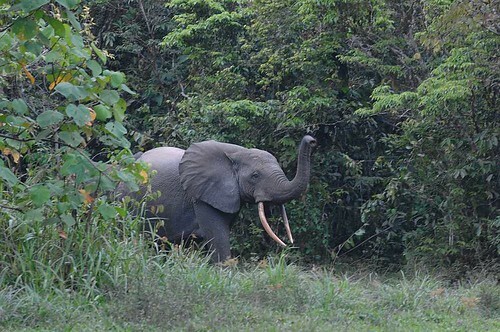 It must include the TuTu River with the elephants and it must include the rich southern area with high bonobo density. I do believe we will get there.